The hazards experienced by lone workers may range from “holes and poles” – workers who operate at height or depth, slips or trips, injury from bearing heavy loads, operating machinery or dealing with chemicals and dangerous substances. However severe the hazard may be, it is essential that an appropriate safety plan is in place to ensure the wellbeing of workers, wherever their location may be. With only 77% of workers reporting they often or always receive training specific to their remote work responsibilities2, it is imperative that companies operating high risk activities not only ensure there are robust health and safety guidelines in place, but that these are tested and adhered to at all times. The need to have fast access to the right equipment to protect employees and the environment they are working in is as necessary in these lone working environments as it is in any purpose built facility. By recommendation, all emergency stations must be located within 10 seconds, roughly 17m, referred to as the “10 second rule”. The challenge can sometimes be implementing practical solutions that really work. If you are working miles from the nearest plumbed in water supply how do you provide emergency response to someone who has been splashed with oil or chemicals or has dust or debris in their eyes? The answer could be a portable eyewash and face wash system. They allow staff working in these remote locations to have instant access to water to decontaminate their eyes or other parts of the body should they become contaminated as the result of an incident. A 76ltr capacity gravity operated eyewash with fitted drench hose allows tap water to be mixed with water preservative that can be used within 180 days. Additionally, a 38ltr stainless steel option complete with pressure gauge, relief valve and an air connector for charging delivers water from either twin spray heads for the eyes and face or via a drench hose attachment. Importantly, it also has a ‘stay-open’ ball valve activated by a stainless steel push handle. Our new Stainless Steel Portable Eye Wash Tank, compliant with the DIN EN 15154 standard, is easy to use, lightweight and offers a capacity of 18ltr. 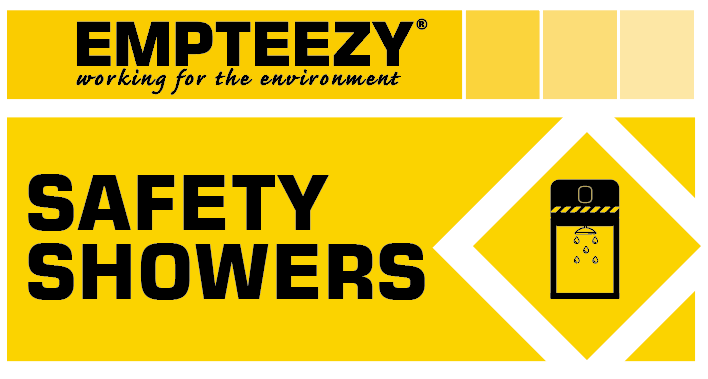 At Empteezy, we have a range of solutions to support the health and safety of remote workers. From our emergency tank showers, designed for locations that have no running water to our portable eyewash stations, browse the range and ensure you are fully compliant. Only 77% of workers reporting they often or always receive training specific to their remote work responsibilities. Be sure you have a robust training procedure in place to limit risk. Workers must have uninterrupted access to emergency stations within 10 seconds of being injured. Portable eye and face washes can provide a perfect solution for remote workers. Page 12, Out of Sight, Out of Mind, A report submitted to the IOSH Research Committee by the University of East Anglia and Affinity Health at Work, September 2016. Why not explore our Portable Eyewash Range?